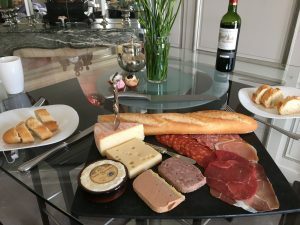 I have always enjoyed cured meats, especially when visiting Europe I make sure to have at least one meal of various meats and cheeses from a local market. Here’s a spread I put together in Paris in Feb 2017. 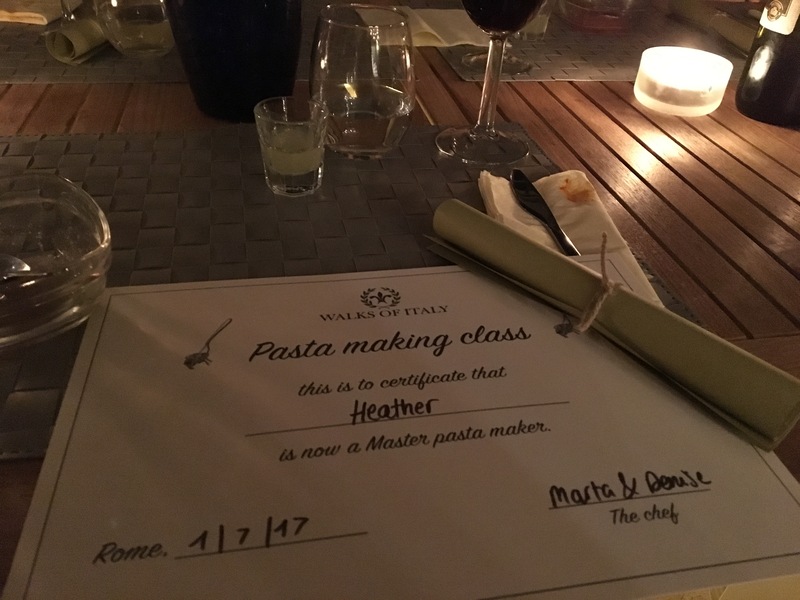 During our trip to Italy June-July this year, we took a cooking class in Rome organized by Walks of Italy, which I highly recommend. As a group of couples we made ravioli and carbonara at a rooftop terrace apartment, featuring real Roman Guanciale which is Italian cured pork jowl (whole cheek). People make carbonara in the states, often substituting bacon or pancetta and parmesan. 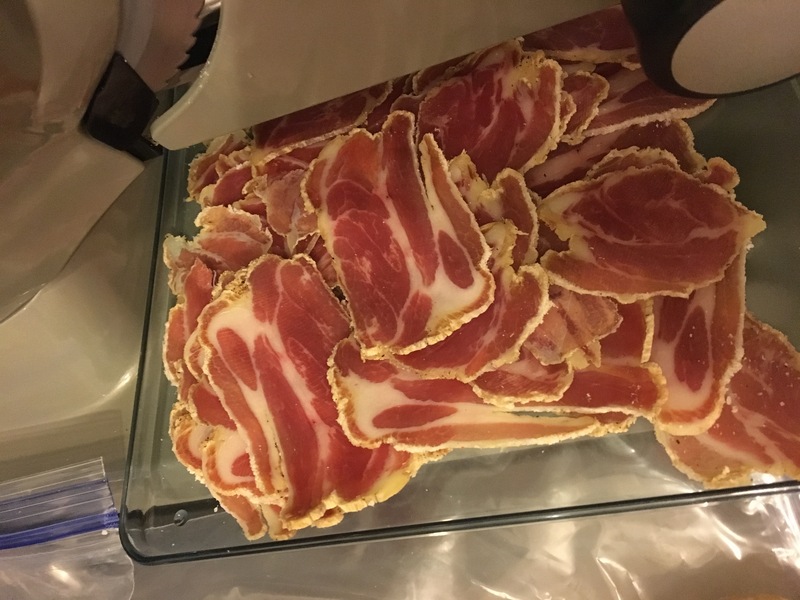 The guanciale has the most amazon fat and flavor, and the instructors explained that authentic carbonara requires no seasoning or fat added as the guanciale and pecorino cheese carry the dish perfectly. Eggs, flour, water, guanciale, and pecorino and nothing else. They also shamed the Americans for dishes like Chicken Aldredo and advised to avoid any “Italian” restaurant that served it. Coincidentally prior to Italy, I had just started making simple cheeses like Mozzarella from scratch, which was a gateway into starting a cured pork loin or Lonzino. 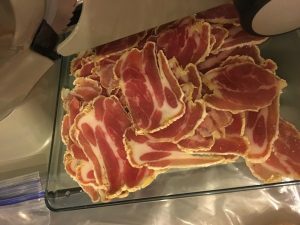 After trying Guanciale in Italy and enjoying plenty of Prosciutto and melon there, I decided to take a deeper dive into the fascinating world of Salumi and Charcuterie. My first Lonzino was not a success by the way, far too salty because I was so concerned with food poisoning/botulism without a proper drying chamber. It looks pretty, but way too salty. 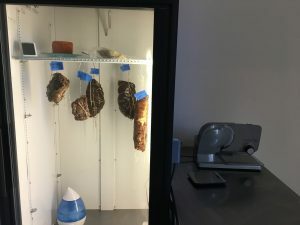 I got a simple wine fridge, temp/humidity sensor, and started apparently what I learned later, the most ambitious type of Salumi – a Salami project. The outcome is yet to be known, but I’m concerned that I may have case hardening due to inability to keep humidity high enough. I later got a compact humidifier, which may have saved them. Time will tell, they’ve lost 32% of weight, but not quite finished yet. Last night I cut into the most dry one and tried with the dogs; no one is sick! It was still a bit too “wet” for my liking so they return to the wine fridge. Salumi – I should have started with this book. This is all about Italian cured meats/cold cuts, typically around pork. This is what I enjoy most. Simon supported turning our garage room into a cellar (he’s the best!!). This garage room was a gym, then guest room, then storage, then guest room, then storage again. 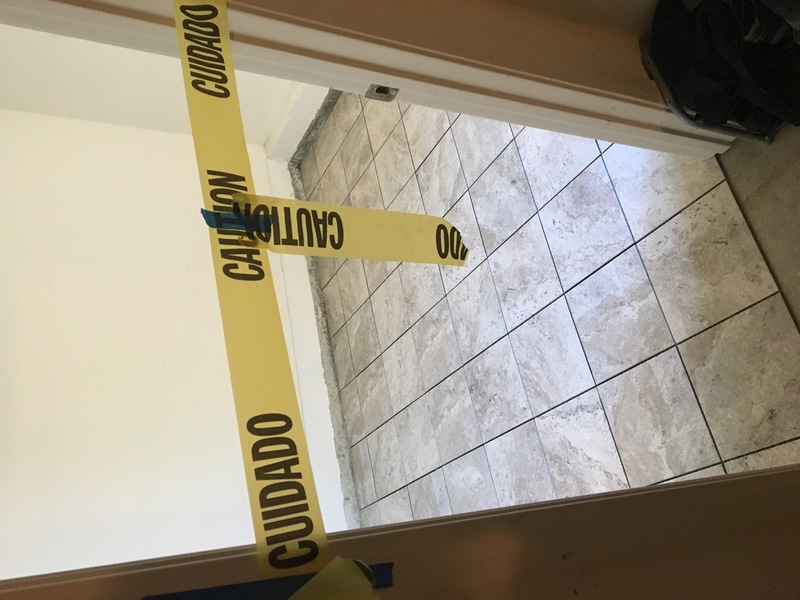 The carpet wasn’t sanitary for curing and wine making so got beautiful Italian Travertine looking porcelain tile laid down. 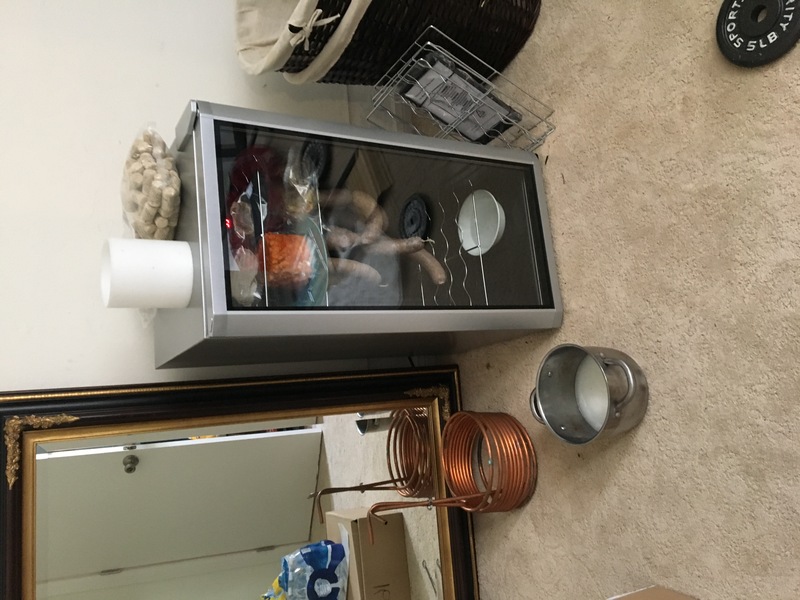 I found a craigslist commercial windowed beverage fridge and hooked up humidity and temperature control. 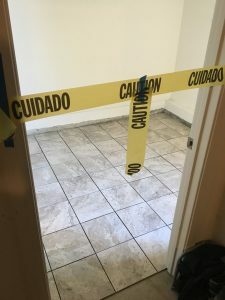 I have been doing a poor job of documenting it with pictures, but will likely include some blog posts of specific recipes I find successful. For anyone looking to do this at home, it doesn’t have to be too expensive or even require a separate cellar room. All you need is an old fridge off craigslist, a humidifier, humidity controller, temperature controller, and optional but recommended inexpensive additional temp/humidity sensor. 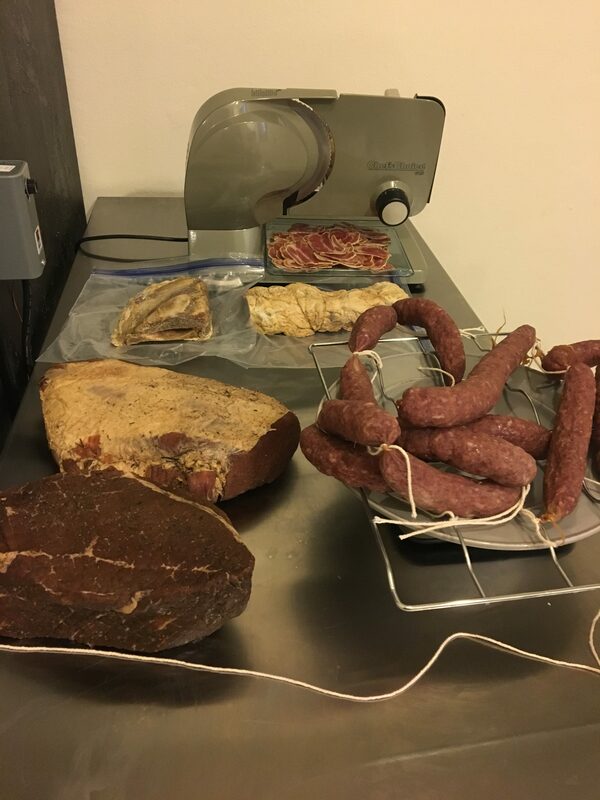 You’ll want to read about nitrates and have a kitchen scale, and probably find a butcher. For sausages there is a kitchen aid attachment for grinding and stuffing. I think the wine fridge works okay without any additional humidity/temp controllers, but I did spend a lot of time monitoring humidity, spraying sausages with water early on, refilling water or changing the USB power to the mini humidifier. 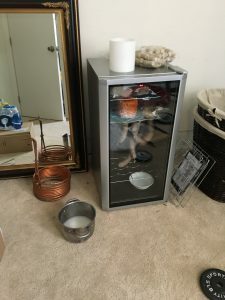 I think you can get away with a small wine fridge; however, it quickly ran out of room for me. Also, in the theme of having a cellar, why not do wine as well. I already have all the equipment from beer brewing, so I thought to try wine making with these inexpensive kits for Chardonnay and Cab Sauv. With the Italian theme, I’m interested in making Lemonchella next.